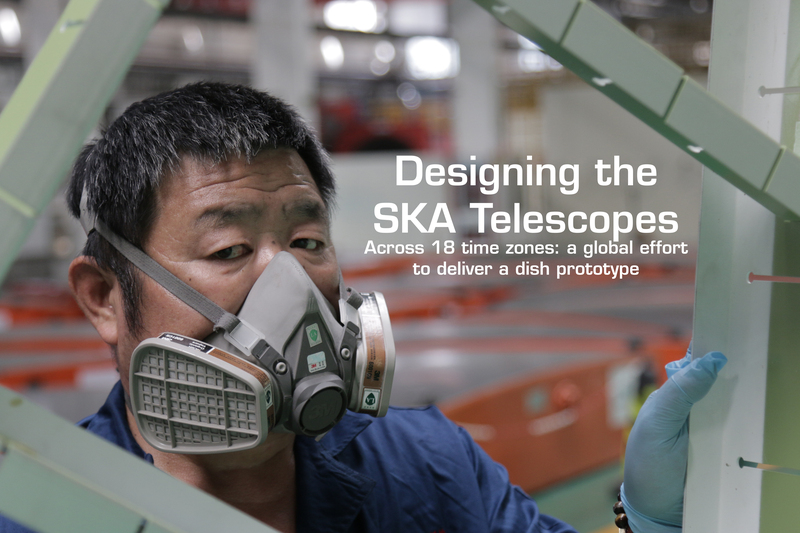 21 December 2017, SKA Global Headquarters, Jodrell Bank, UK – In the second part of our feature story on designing the SKA telescopes, we look back at the ongoing global effort to deliver the SKA dish prototype, with work happening in many countries. As the year comes to a close and many of us wind down for the holiday season, teams of scientists, engineers and manufacturers in Canada, China, France, Germany, Italy, Sweden, UK and South Africa – all part of an international consortium – are busy designing, manufacturing, testing and refining optics, structures and instruments before they can be brought together to become what is perhaps the most familiar part of a radio telescope: a dish. 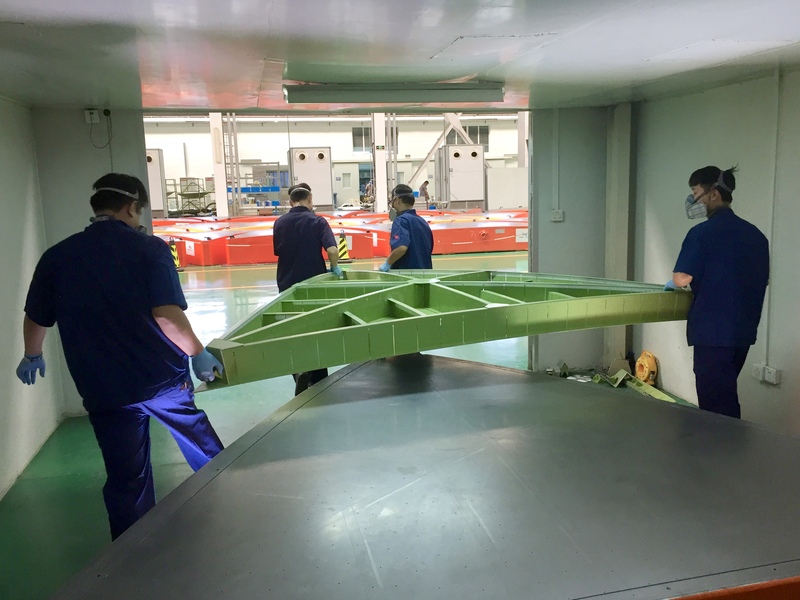 Across 18 time zones, extensive work has taken place over the past 19 months as the teams press on towards building a fully functional SKA dish prototype with all optics and three receivers. Eventually, the SKA1-mid instrument, the South African arm of the first phase of the SKA telescope, will comprise of 133 dishes, complemented by the 64 dishes of the MeerKAT telescope already installed in the Karoo region. Three different antenna concepts were initially developed to be considered for the design of the SKA dish. All three were constructed using different technology from different partners, representing the very best in radio telescope dish technology currently available. 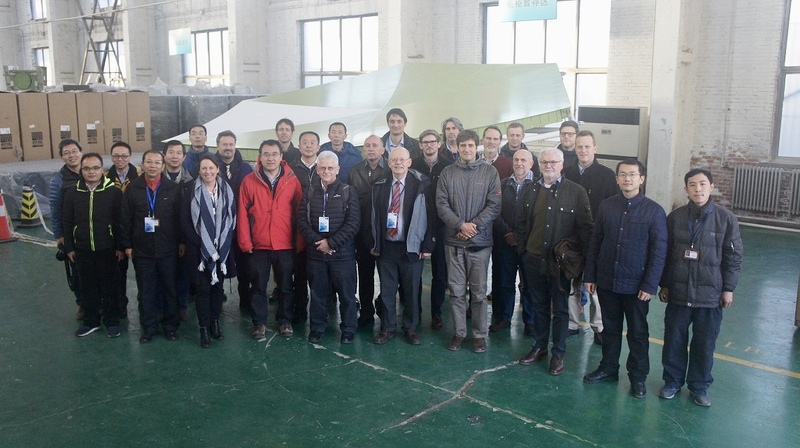 In May 2016, following a unanimous recommendation by a five-strong selection panel of engineering experts in the fields of composites, radio telescope antennas and systems engineering, the SKA Organisation selected concepts proposed by a Shijiazhuang, China-based team composed of the 54th Research Institute of China Electronics Technology Group Corporation (CETC54) and their European partner, MT Mechatronics (MTM) of Mainz, Germany and S.A.M from Naples. The selected design was an optimised panel space-frame supported metal (PSM) concept, made up of 66 panels for the main reflector. 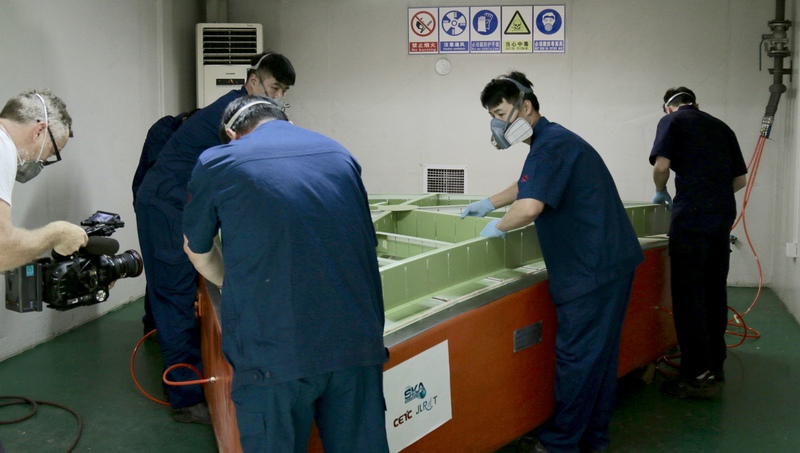 CETC54 have undertaken the production of the main reflector, sub-reflector, backup structure and pedestal for the dish. 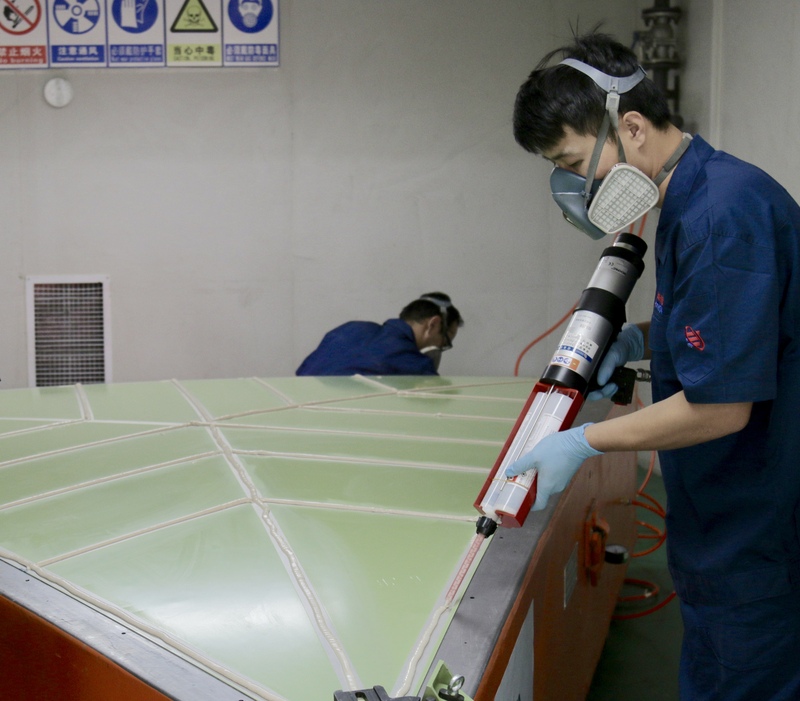 Since 2016, the group have produced 66 unique moulds to shape the 66 different metallic triangular 3m-a-side panels that make up the main reflector, each with its own specific curvature depending on its position. 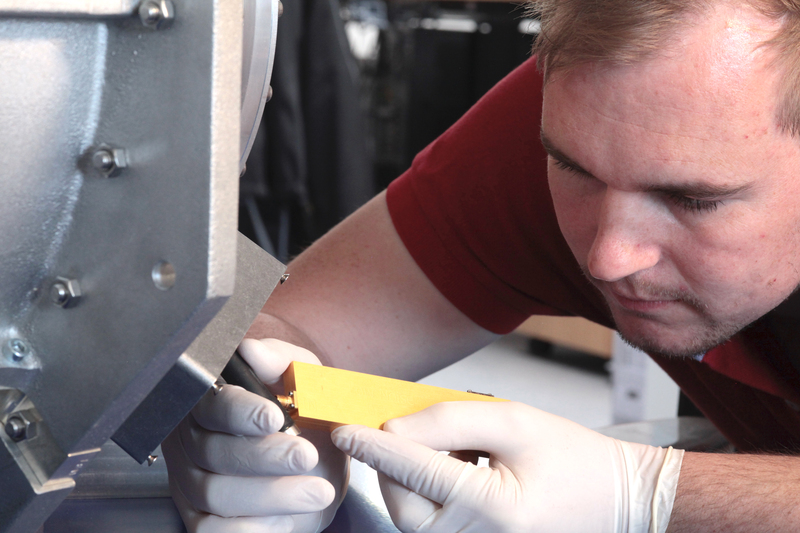 Each mould weighs between 4 and 5 tons and was made with an average surface accuracy between 0.010 and 0.030 mm – less than the width of a human hair. One of the main challenges faced by the group is to deliver optimum performance in terms of surface accuracy and curvature, replicated for each of the 66 panels, and in the future for each dish. In total, 8778 such panels will need to meet the exact same specifications in the first phase of construction of the SKA. Whilst the tolerances are not as tight as their optical counterparts due to the fact that radio wavelengths are longer than optical wavelengths, they still have to be built to a level of precision unsurpassed in the field of radio astronomy. 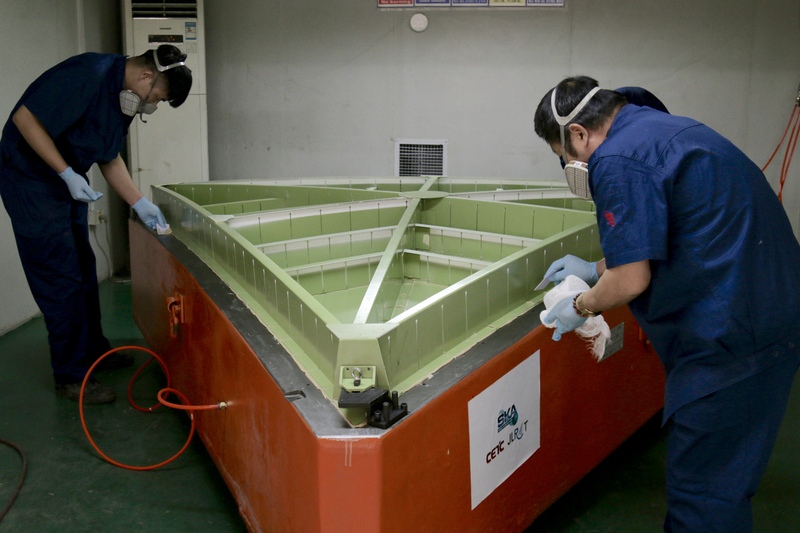 The panel is formed and shaped on the mould using suction while its backup structure is attached and formed. It is then bonded using a special high performance adhesive. “This is a mature method created by CETC54. 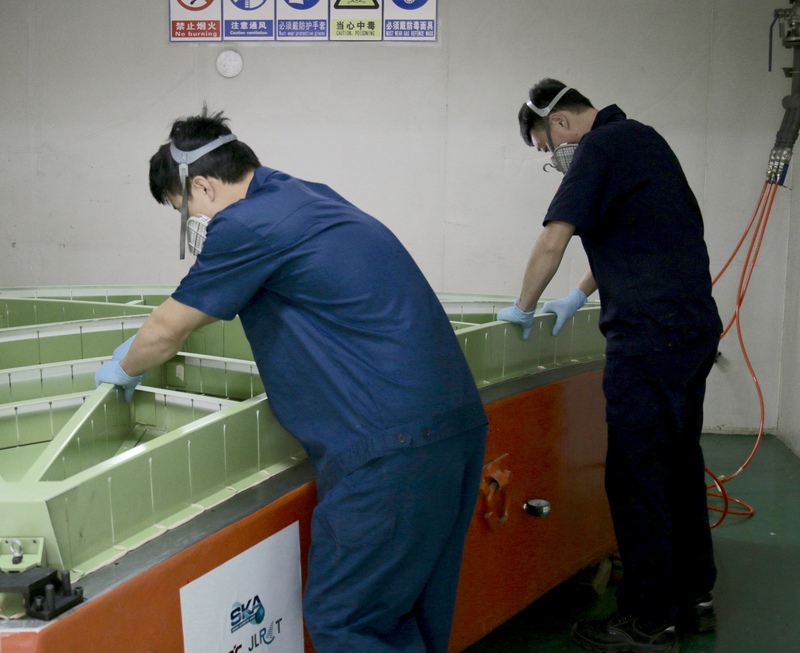 Applied to the SKA panels, it allows us to achieve and maintain the dish surface to a very precise surface-accuracy level as well as consistency for all panels”, said Wang Feng from the Joint Laboratory for Radio Astronomy Technology (JLRAT), recently appointed SKA Dish Consortium Lead. “Our Chinese partners are extremely well resourced. They’ve demonstrated that they have the technology and capability to construct a telescope with the requirements that the SKA have”, adds Mark Harman, SKA Organisation Project Manager for the Dish consortium during a visit of the fabrication workshop in September 2017 as production was in full swing. As 2017 comes to an end, all moulds have been produced and the team is busy finishing the production of the 66 panels. The SKA sites were chosen for their radio-quietness, which will allow the telescopes to detect the faint signals coming from Space. To preserve this pristine environment, the SKA project is going to great lengths to make sure that all equipment eventually installed on site – from the solar panels used to generate electricity to the large server racks needed to process the signals, the instrumentation on the dishes themselves and indeed the servomotors inside the pedestals – emits a minimum of radio frequency interference (RFI) and is properly shielded so that their emissions don’t swamp out the signals that the telescope is trying to pick up. 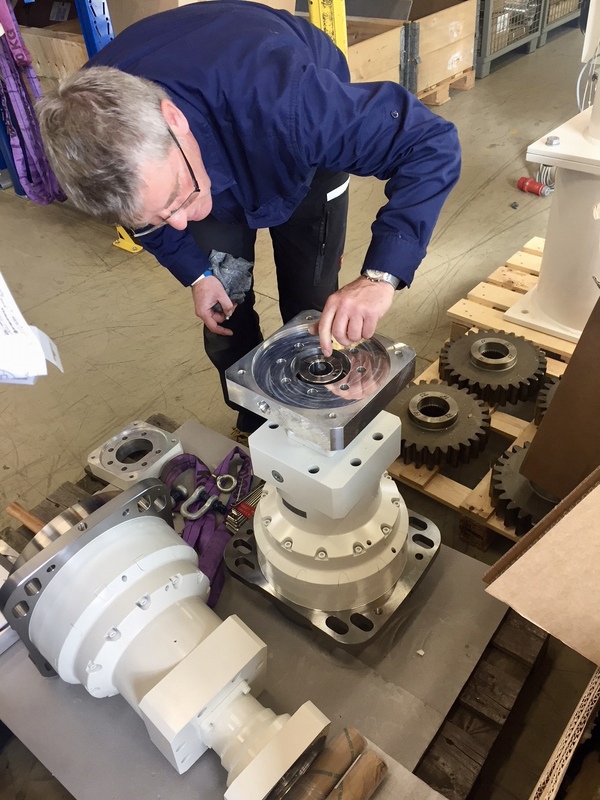 Meanwhile at their integration facility in Mainz, Germany, MT Mechatronics (MTM) have been designing and manufacturing the precise hardware and electronics – such as the Drive Units and Electronics – used to move the dish. 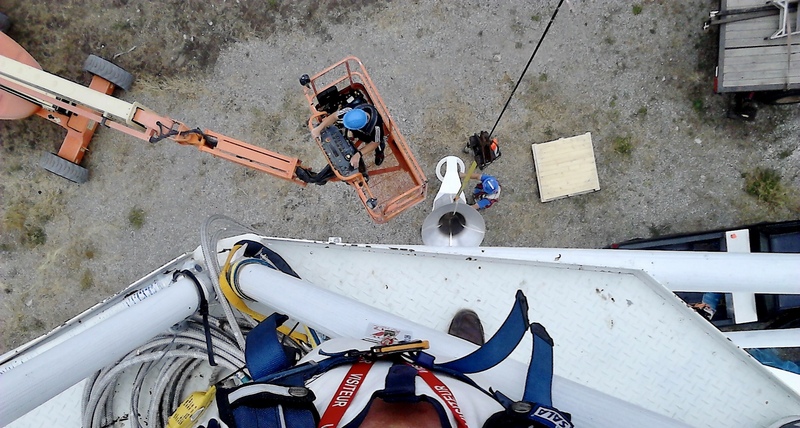 Their challenge is to manufacture high quality equipment to fit in a restricted space pre-determined by the diameter and height of the pedestal, as well as to make that equipment RFI-compliant. These servo drive systems are crucial to the proper and precise operation of the dish. If an alert is sent out, the SKA telescope will need to move and point at a new object with a precision of a few arcseconds (1/3600 of a degree) to follow up on transient events like supernovae and fast radio bursts. It’s an essential capability for a responsive telescope. 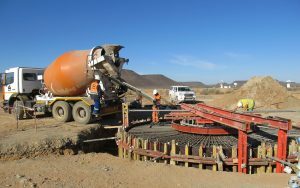 “Our challenge is to design and manufacture servo drive systems that will be able to translate the instructions from the Telescope Manager software to move the hundreds of SKA dishes synchronously and with that level of precision under the harsh environmental conditions of the Karoo area” explains MTM’s Managing Director and SKA Dish Structure Lead Engineer Lutz Stenvers. This requirement adds another layer of complexity on top of the performance expected of the SKA-mid dish telescope. In the next few days, the servo systems will be packed and shipped to China to be assembled with the rest of the dish during the Christmas period. MTM engineers will then travel to CETC54 in January to commission the servomotors. 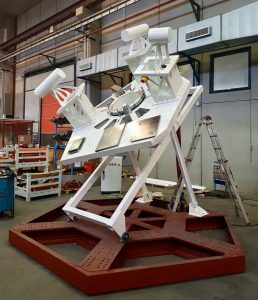 In Italy, near Naples, the Società Aerospaziale Mediterranea (SAM) is working on the design and production of the feed indexer, an electro-mechanical component that will support the various receivers and move them into position to align them with the optics of the dish when required, depending on the observations. 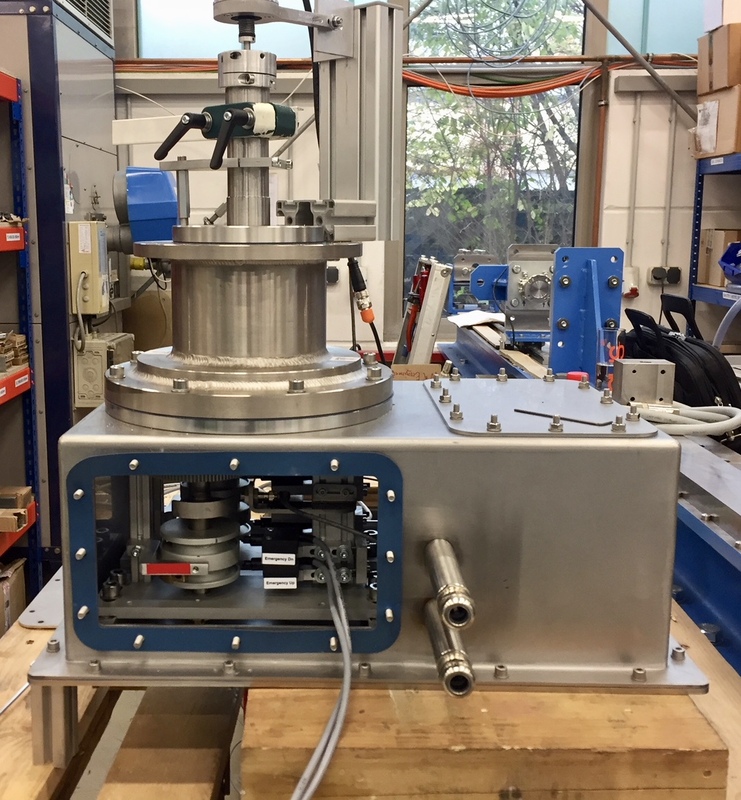 The team has recently conducted the final tests at their facility in Naples, before shipping the indexer to China for assembly on the dish in January. 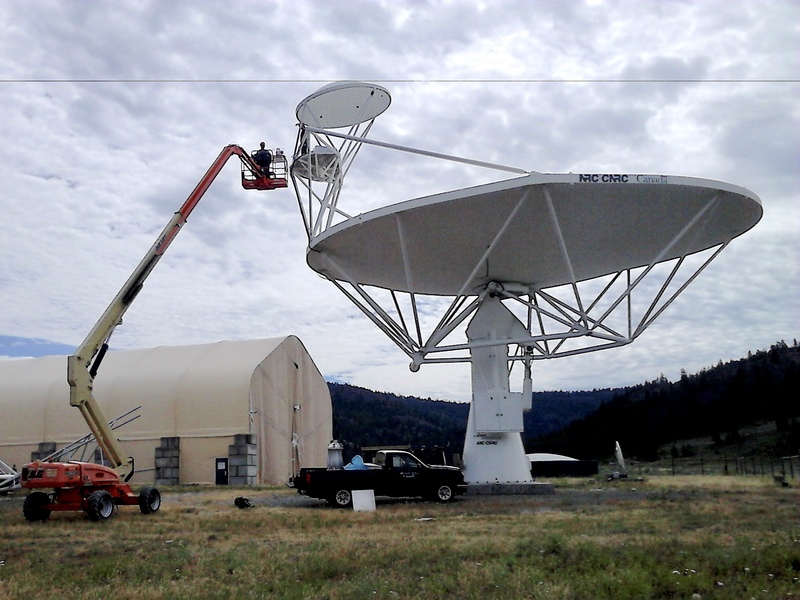 The Dish consortium also includes the delivery of some of the instrumentation – the receivers – for the dishes. 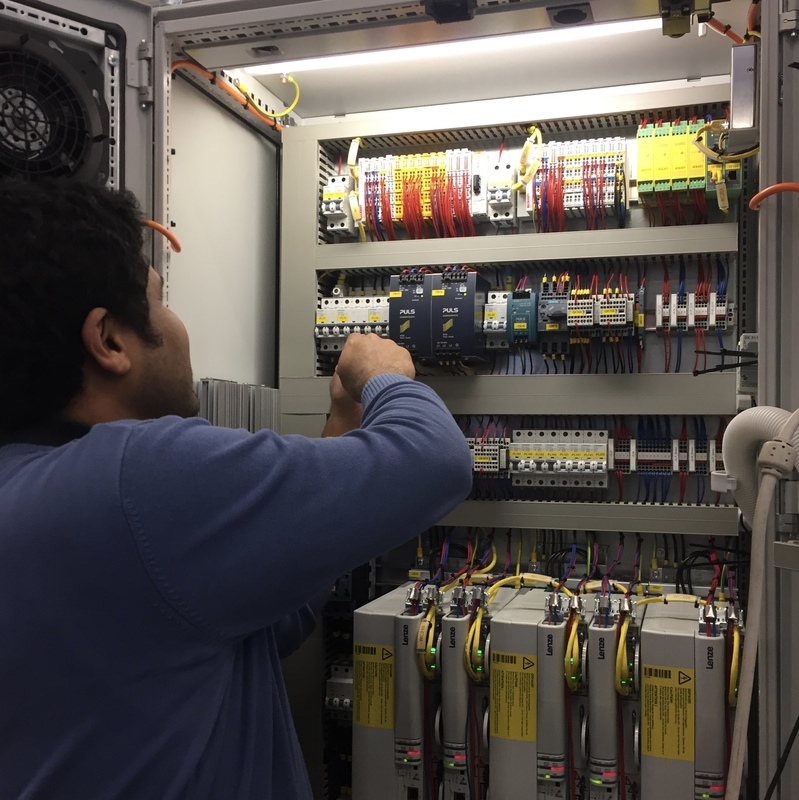 A group of engineers at the National Research Council (NRC) Canada, are developing the hardware that digitises the signals recorded with each of the five feeds. The University of Bordeaux, France will contribute their expertise enabling the digitisation of high frequency signals. The receivers prepare the analogue signals from the feeds to a digitised data for transmission over optical fibre. As part of the consortium’s work for its Critical Design Review (CDR), prototype receivers are being developed for the high-priority Bands 1, 2 & 5, covering the frequency ranges of 350 MHz to 1.05 GHz, 950 MHz to 1.76 GHz and 4.6 to 15.3 GHz respectively, thus allowing to cover wavelengths from 2-86 cm. 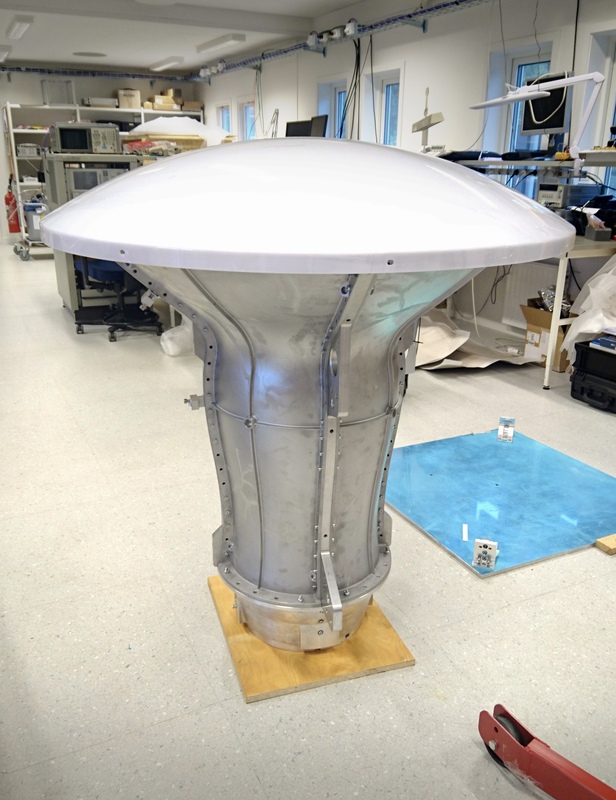 In 2016 the team from Onsala Space Observatory at Chalmers University of Technology, Sweden, designed and manufactured a first Band 1 feed for the SKA dish. 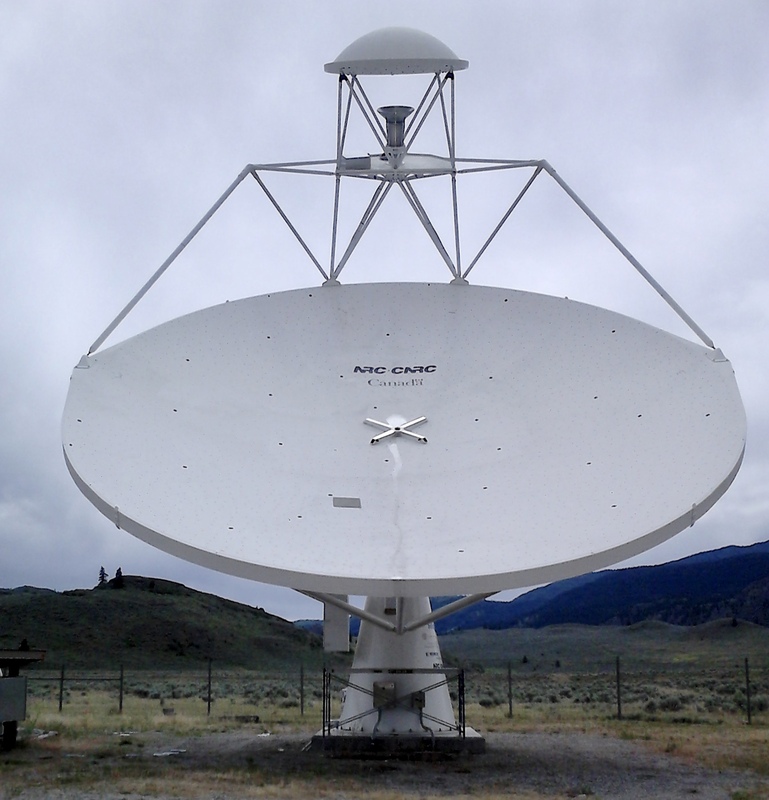 In June 2016, it was shipped to the Dominion Radio Astronomy Observatory in British Columbia, Canada for site testing on a full-size SKA prototype dish built by the National Research Council of Canada a few years ago. The huge feed horn, with an opening close to 1m in diameter and weighing more than 100kg, was lifted 12m into the air to be fitted on the dish. Following a programme of different tests over 18 months in Canada and Sweden the team was able to improve the design of the feed to maximise its performance. The new improved feed uses components made in Onsala together with others from the Swedish company Ventana Hackås AB – at almost 63 degrees North! – and ridges made by MegaMETA in Lithuania. A key component in the Band 1 success story are its low-noise amplifiers, developed by the Gothenburg company Low Noise Factory. Normally, amplifiers for radio telescopes have to be cooled to a few degrees above absolute zero. Instead, the amplifiers have been specially designed to maintain sensitivity without using any cooling at all. For the SKA, that translates into potential savings in energy, maintenance and investment. The upgraded feed will be shipped to South Africa in 2018 to be fitted onto the SKA dish prototype at the South African SKA site. 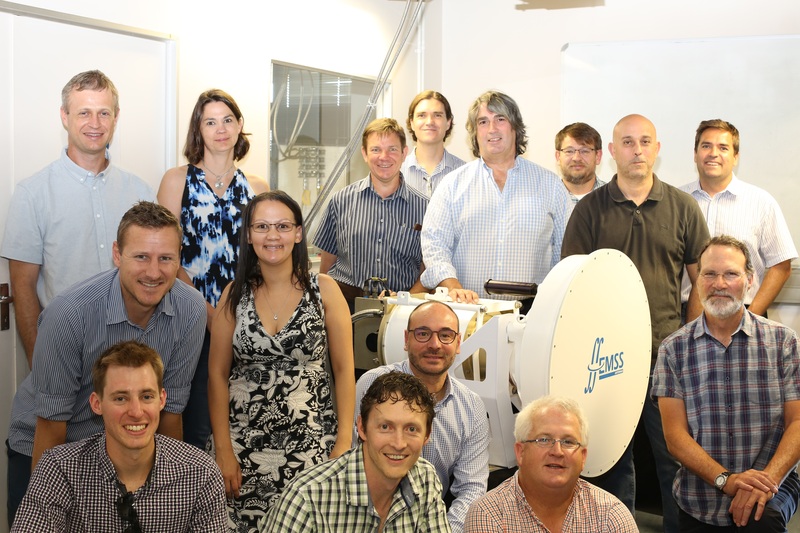 Early in December 2017, a development team from EMSS Antennas in Stellenbosch, South Africa, working on the band 2 receiver and assisted by the South African Radio Astronomy Observatory system engineering team successfully concluded the CDR for their sub-deliverable with the dish consortium. The panel included international experts on radio astronomy receivers, including representatives from SKA Organisation, the National Research Centre of Canada, the European Space Agency and the Instituto de Astrofísica de Andalucía in Spain. Encouragingly, the results are much better than the required receiver noise temperature, which would result in very good system sensitivity on the optimised optics. A later addition to the project was the Band 5 Feed system developed in the UK by Oxford University and the Science and Technology Facilities Council (STFC). This feed system will provide SKA with capability to observe from frequencies of 4.8-15.3 GHz. The group are in the design stage and have recently undertaken a major review of the design. Prototyping of critical components is underway to validate their performance. As a result of the very good performance of the dish’s optics, it’s also been proposed to expand the upper edge of band 5 from 15.3 GHz to 25 GHz and possibly higher. This would allow the SKA to contribute even more to studies of planet-formation and exobiology. To control the dish system a Team of specialist Telescope Software engineers at the Italian National Institute for Astrophysics (INAF) are developing the Local Monitor and Control (LMC) system. This will monitor, coordinate and control the Dish subsystems. This requires close interaction with all the teams. The INAF LMC control system will act a glue to harmonise all the components in the dish to act as one system. This is no simple task when they need to coordinate the activities of 200 engineers in seven countries. In June 2017, the South African and Italian engineers led by Corrado Trigilio, coordinator of the LMC group for INAF, successfully carried out a communication and operation test between the central control of the Dish, the LMC element and the receiver system controller that will be installed at the focus of the telescope. So what next? 2018 will be an exciting year as the work of the consortium will be nearing completion and the pieces of this international puzzle come together ahead of their Critical Design Review. 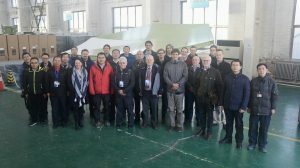 A ceremony at the CETC54 factory in China in early February will mark the first assembly of the dish with its main reflector, sub-reflector, back structure and pedestal from China, servomotors from Germany and feed indexer from Italy. 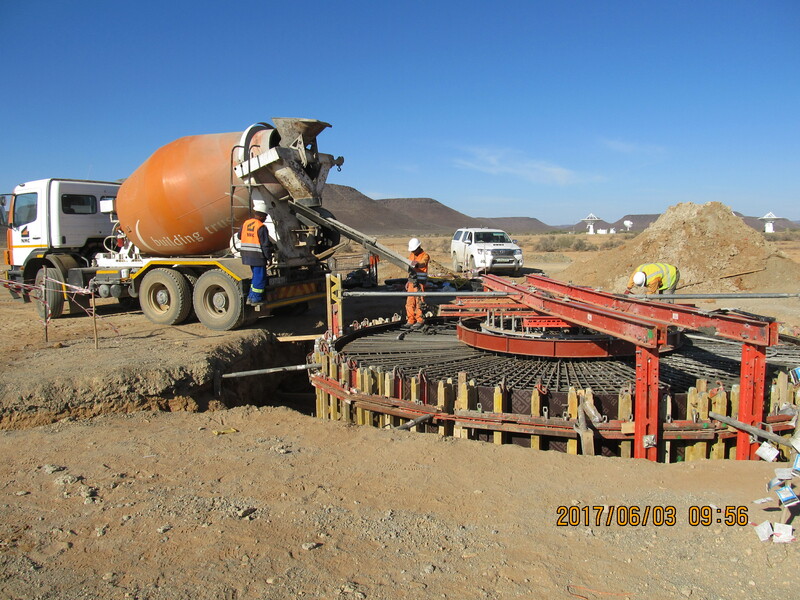 Shortly after, a second dish, currently under production by the same partners and funded by the German Max-Planck Institute, will be shipped to South Africa and assembled at the South African SKA site where in June 2017 teams from the South African Radio Astronomy Observatory SARAO poured the concrete foundation on top of which it will stand. For the first time, a full SKA dish prototype will be assembled at the site of the future SKA1-mid telescope with its various components from Dish consortium partners. “At that point, we will be confident that we’ve delivered a reliable and high performance dish that meets, and very likely, exceeds the specifications. After that, we’ll be ready to mass produce them in the hundreds!”, he concludes. The Dish element of the SKA is probably what most people think of as a radio telescope. The international Consortium is responsible for the design and verification of the antenna structure, optics, feed suites, receivers, and all supporting systems and infrastructure ahead of the production of the 133 SKA-mid dishes in Phase 1 of construction of the SKA. The selected design for the SKA dish is a German / Chinese collaboration between MT Mechatronics and CETC54. The consortium is led by CETC54 in China.